Our toy-hauler trailer is a work in progress. We have changing demands with a growing family etc. and we don't have the funds or time to do it all at once. When we bought this trailer, our needs were clear. We needed a big enough trailer to haul our bronco/rock crawler, while having the essential living space as well. It still serves this purpose, but since we don't haul the crawler that often we tend to want more bed space with a quicker set up/take down time. Every minute we can save in setting up and taking down is one more minute of fun and one less minute of stress, which means that we can go more often with less hassle. We found R&B Components when we were looking for our dinette. It fit the bill and our application really well and it hasn't let us down. Our latest addition is our Sofa Sleeper, pictured here to the right. 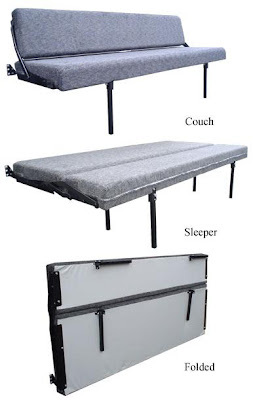 It folds down into a sofa, then into a bed at night. We needed a large bed, so we bought 2 and combined them to make 2 couches and one large bed. We ordered shorter sofas, then we had to weld on brackets to space them towards the center so they would meet when folded down. We also added a bracket on the back door for a TV. We have the option of 2 TV locations depending on what we're doing, plus this set-up makes a nice area for watching movies while letting us use the dinette at the same time in the middle part of the trailer. The foam is very firm, which I like, and the fabric seems to hold up really well to abuse. Like I said, the main thing here is nice practical comfort that can be set up quickly, saves space, and has multiple uses. This is really important where space and time is at a premium. Here's some pics of the finished product on our last outing. They will easily fold up and attach to the straps secured to the wall and allow us to load our toys. Pretty cool stuff. Looks like you moved the tv too, I like it! Now those are nice folding furniture setups. I used to build travel trailers several years ago. One of my jobs was to install the folding sofas in trailers and utility campers. The sofas were bulky and hard to manage. These look like a dream by comparison. Since space is so much of a concern when in a trailer camping or riding at events you don't want something clumsy. I'm currently looking into a trailer for Horse dentistry. These look like a design could take along for over night trips.